Exercises for dogs – how much exercise and which exercises to choose for your dog? Dog breeds are usually distinguished by different characteristics. One of those characteristics is their energy level. While there are indeed some dog with low energy levels, I would say MOST dogs really need some exercise. Bull Terriers, for example, especially when young, often have pretty high energy levels and therefore need quite an amount of attention and exercise. Not every kind of exercise is suited for any dog. Some dogs will be completely happy with walks and should not be encouraged to perform certain exercises, such as excessive jumping, long-distance running etc. -because of their physiognomy. That does not mean these dogs just do not need exercise. It just means that other exercises may be more appropriate for them. 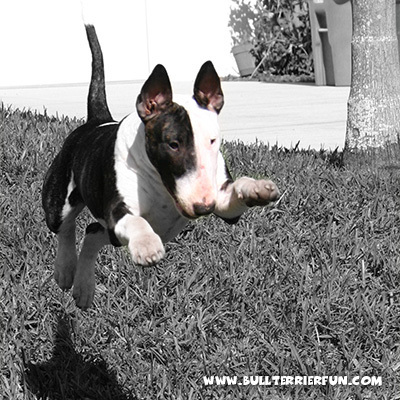 Bull Terriers are often referred to as “kids in a dog suit”. If you have lived with one of them for a while you will probably approve this saying. These Dogs have a sweet and fun-loving disposition. They are energetic, agile and playful. English Bull Terriers are intelligent and eager to learn. Some say they are “thinkers” and have to figure out things their own way. This is why they are often considered harder to train than other dog breeds. Also this facet of the Bull Terrier character may be the cause of their reputation as stubborn individuals.